One theme of our visit to Australia was that we never had enough time to see all of the things in a particular area (never mind the vast majority of Australia's land mass that we didn't even attempt to see on this trip). This pattern was already apparent even at our first stop, which was Melbourne. We had only two full days in Melbourne, and during the first one, we were a bit groggy from having to get up before dawn to catch our flight from Wellington. We managed to pack in quite a bit of sightseeing in our two days, but if I'd known about the nearby colony of fairy penguins earlier, I would surely have lobbied to add a day to go see them! As it was, I had to limit my wildlife watching to finally seeing an Australian possum in the wild (ok, in the middle of the city, but at least it wasn't in a zoo). 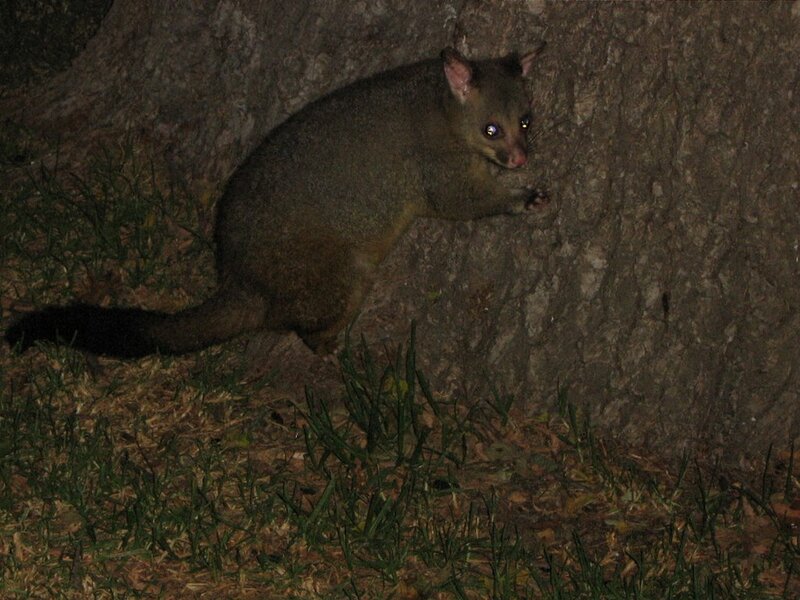 These antipodean possums look nothing like our Northern hemisphere rat-like creatures. The Australian possums are cute and furry, and you can actually understand why someone decided to introduce them into New Zealand to start a fur industry. When I first heard about this, my reaction was disbelief, because I was envisioning the fur of the Northern hemisphere creature and wondering what sort of wacko would want a coat made out of that. To be fair, my husband was equally ignorant of our Northern hemisphere possums. The first time he saw one, he came in and calmly announced that he didn't want to alarm me, but there was a giant rat on our steps. We didn't spend much time looking for wildlife (the possums were actually easily spotted in the park near our hotel at night), so we filled the educational portion of our time with a trip to the Melbourne Museum and the Melbourne Gaol. The museum provided an interesting view of the coming of the settlers from the perspective of the indigenous people. The exhibit was created in consultation with representatives of the aborigines and Torres Strait Islanders. Since I have never gotten around to reading The Fatal Shore, I lacked the settler's viewpoint and the major historical context, so found the story a bit disjointed. However, it was interesting to have my first real introduction to a colonization story be from the viewpoint of the indigenous people, since my school age introduction to the American colonization story was of the "brave, hardy settlers" variety. The truth, I'm sure, is somewhere between these extremes, and I hope that some day, we will be able to tell it. For now, it is only fair that the pendulum has swung to the indigenous people's story, and it is the settler's turn to fell like their hardships and sacrifices were overlooked and their ancestors painted in a rather one-dimensional way. The Melbourne museum's exhibit did include some stories about settlers who tried to treat the aborigines fairly, but often without much context. Perhaps this context is common knowledge in Australia, like our Wild West stories are here in the US. Sadly for the aborigines, I think the preponderance of stories about less egalitarian settlers probably reflects history more than any oversight on the part of the curators. Our visit to the Melbourne Gaol the following day provided some of the settler's history, and also gave insights into the harshness of the times and conditions. The gaol was the final home of the infamous Ned Kelly, an Australian outlaw/Robin Hood figure. He was hung here. This was interesting, but I found the stories of some of the other inmates more touching. The women, in particular, often seemed to be more victims of their time than cold-hearted criminals. There was almost no legal way for a woman to support herself and her children if her husband deserted her or if the father of her child refused to marry her. Some women killed their children so that they could work as a domestic servants. Others turned to "baby farming", which was essentially operating an unlicensed (and often very overcrowded) day care center. If anything went wrong at a "baby farm" and a child died, both the proprietor and the mother, who was probably working as either a domestic servant or a prostitute, would be held responsible, since it was illegal to leave your child in a baby farm. You could see how one mistake, or worse, the irresponsibility of her chosen husband, could doom a woman to a chain of events that led to being incarcerated or even hung at the Melbourne Gaol. Despite this gruesome past, the Gaol is apparently a popular place for events. 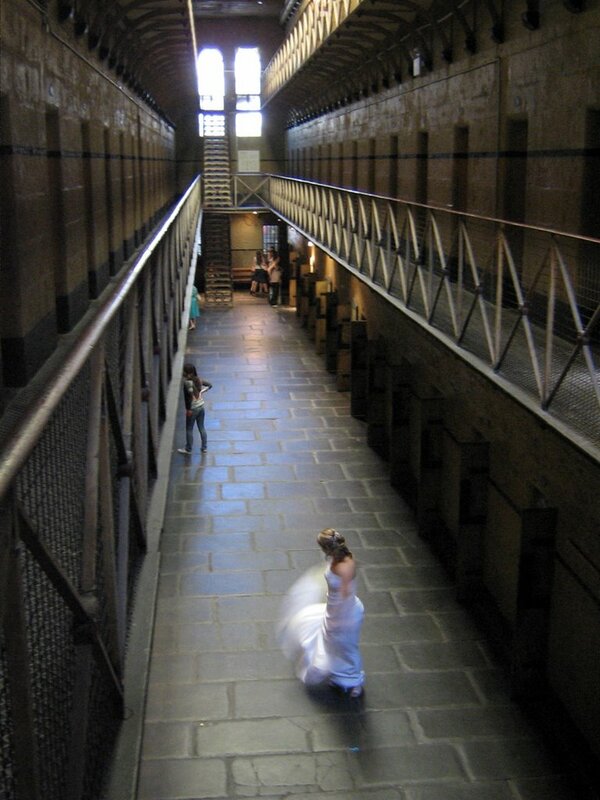 The day we were there, a wedding was taking place in the courtyard next door, and the bridal party was getting pictures taken in the Gaol. They had opted for a 20s gangster style dress theme, so I guess it all tied in. Certainly, they will be striking wedding photos! One of the other highlights of Melbourne was strolling by the riverfront at night, when they shoot giant jets of flame from sculpture/fountain like structures along the bank. 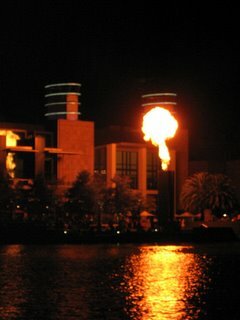 The flame is so big that you can feel the heat even if you are viewing the show from across the water (as we did on the second night), It is not a very energy-efficient feature, but it is definitely an experience that we won't forget. I had never heard of the baby farming history. That's as interesting as it is sad and gruesome. Thanks for sharing the story. Hmmm... I have The Fatal Shore, and can never seem to get around to reading it. Maybe Thomas Keneally's one would be less intimidating!